Yet Kidd cannot resist the temptation to insert two pages of self-interrogation. 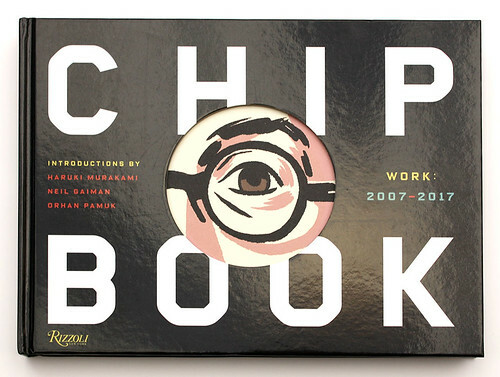 Similarly, the book is peppered with pictures of the designer with notables – Paul Simon, Supreme Court Justice Stephen Breyer, Robert Downey Jr. Once you get past that, Kidd’s second monograph is not bad, given his track record of sensitive-yet-commercial covers for novels, comic book series and glossy non-fiction. He has an engaging way of describing his interactions with writers, editors and clients and the process of book cover design: ‘My job is to create graphic design that generates mystery,’ he writes, in a feature originally published in McSweeney’s no. 33. ‘Convergence’ series for DC Comics. Kidd designed 160 covers, 80 of which were published. Top: Opening spread for Chip Kidd Book Two. Work: 2007-2017. Alan Moore’s portrait across several book spines for the cover of Gary Spencer Millidge’s biography of Moore (left) and cover design for Dave Gibbons’s Watching the Watchmen (right). Kidd is unusual in achieving designer fame while remaining at Knopf for most of his career, a feat achieved by few in-house designers, though Berthold Wolpe (Faber) and Vaughan Oliver (4AD) spring to mind. The wide, weighty format duplicates that of his first book (see review in Eye 60) and includes nuggets of biographical information (his wedding, his garage band Artbreak). The generous size (322 pages) means there is plenty of room for workaday covers in addition to the triumphs. In a short digression from books (in the aforementioned McSweeney’s article) he speculatively redesigns the Amtrak rail ticket. Covers, published and unpublished, for Irène Nemirovsky’s Suite Française and her subsequent novels. Cover for Only What’s Necessary, Abrams ComicArts, 2015 (left), and right: The original artwork used for the cover and an assortment of spreads from Schultz’s book. Cover and end paper / title page for David Rakoff’s Love, Dishonor, Marry, Die, Cherish, Perish that shows through die-cut holes in Kidd’s cover design. ‘Flame-haired Margaret’ by Seth. A gripping sub-plot to Book Two lies in his continuing relationship with immensely talented illustrators such as Charles Burns, Ryan Heshka, Seth and Chris Ware (on whose behalf he collected multiple awards at Comic-Com 2015). Comic strips bring out an extra dimension of flair and scholarship in Kidd, as in Only What’s Necessary (Abrams), his visual history of Charles M. Schulz (Peanuts). Kidd comes across as a likeable, if somewhat hyperactive character, a graphic design Renaissance man whose career also embraces two novels (The Cheese Monkeys and The Learners), series design (the original and effective 80-book ‘Convergence’ for DC Comics) and GO: A Kidd’s Guide to Graphic Design (Workman), the manual he wrote to teach graphic design to children. Cover for Chip Kidd Book Two. Work: 2007-2017.